As of June 30, 2017, the last day of the registrant’s most recent fiscal second quarter, the aggregate market value of the common stock held by non-affiliates was $35,555,999 based upon the latest known sale price of the quarter on May 26, 2017 of $4.50 per share. As of June 30, 2018, there were 30,500,000 shares of common stock issued and outstanding. This report contains forward-looking statements. These statements involve known and unknown risks, uncertainties and other factors which may cause our actual results, performance or achievements to be materially different from any future results, performance or achievement expressed or implied by the forward-looking statements. These risks and uncertainties include, but are not limited to, the factors described under “Business,” “Risk Factors,” and “Management’s Discussion and Analysis of Financial Condition and Results of Operations.” In some cases, you can identify forward-looking statements by terms such as “anticipates,” “believes,” “could,” “estimates,” “expects,” “intends,” “may,” “plans,” “potential,” “predicts,” “projects,” “should,” “would” and similar expressions intended to identify forward-looking statements. Forward-looking statements reflect our current views with respect to future events and are based on assumptions and subject to risks and uncertainties. Given these uncertainties, you should not place undue reliance on these forward-looking statements, and there can be no assurance that the forward-looking statements contained in this report will in fact occur. This report contains forward-looking statements, including statements regarding, among other things, (a) our projected sales and profitability, (b) the regulations to which we are subject, (c) anticipated trends in our industry and (d) our needs for working capital. Forward-looking statements represent our estimates and assumptions only as of the date of this report. You should read this report and the documents that we reference in this report, or that we filed as exhibits to this report completely and with the understanding that our actual future results may be materially different from what we expect. References in this report to “we,” “us,” “our” and the “Company” and words of like import refer to Longbau Group, Inc. and its subsidiaries. We offer pre-need death care contracts and pre-need and at need funeral services and selling funeral related products to customers. We operate our Taiwan death care business primarily through Long Bao Life Technology Co., Ltd. We also provide life, property and casualty insurance products and insurance brokerage services to our customers. In addition, we are actively pursuing business plans focusing on management consulting services and consulting contracts. We operate our Taiwan insurance intermediary business primarily through Ho-Cheng Insurance Brokers Co., Ltd. We intend to utilize a combination of various marketing channels, including, without limitation, telephone sales, in and out of Hong Kong and Taiwan, third-party sales agents, ecommerce, and corporate strategic partnerships and alliances. Our goal is to establish an international brand on death care management consulting services, pre-need and at need funeral services and insurance products with high quality and name recognition. Company actively sells pre-need death care contracts and insurance products through its subsidiaries in Taiwan. In 2018, the Company plans to expand its scope of customers to include medium-size and large enterprises. Currently, the Company is actively pursuing entering consultancy contracts with small death care service providers in Hong Kong and Taiwan. We will be marketing death care management consulting services in one package to our customers. We believe that the innovation and timely introduction of our new service is essential to attract customers. As we are still at our early start-up stage, we are still developing our information systems. As a holding company with no business other than holding equity interest of our operating subsidiary in Hong Kong, we will rely principally on dividends to be paid by Longbau Hong Kong. In September 2014, we established another subsidiary in Taiwan, Longbau Management Consulting LLC (“Longbau Taiwan”), to provide death care consulting services and sell death care products across Taiwan. Longbau Taiwan is 100% owned by Longbau Hong Kong. On December 29, 2016, Longbau Group, Inc. (“Longbau”), Long Bao Life Technology Co., Ltd (“Long Bao Life”), the Shareholders of Long Bao Life, and Tsai Ko entered into a Share Exchange Agreement (the “Long Bao Life Agreement”). Long Bao Life is a private company incorporated in Taiwan in 2007. At the December 29, 2016 closing of the Long Bao Life Agreement, 250,000 shares of Longbau common stock, par value $0.00001 per share were issued to Long Bao Life’s shareholders in exchange for 100% of Long Bao Life's issued and outstanding ownership interests (“Long Bao Life Exchange Shares”). Upon completion of the foregoing transaction, Long Bao Life became a wholly-owned subsidiary of Longbau. Long Bao Life provides pre-need and at need funeral services and sells funeral related products, such as urns, in Taiwan. A pre-need death care contract enables a customer to make his/her own funeral arrangements in advance and prepay for the funeral, which reduces the burden of the family at the time of bereavement as well as avoids the influence of rising costs. Also, the company provides consulting services to customer prior to the purchase. Ho-Cheng Insurance Brokers Co., Ltd.
On December 29, 2016, Longbau, Ho-Cheng Insurance Brokers Co., Ltd. (“Ho-Cheng Insurance”), the shareholders of Ho-Cheng Insurance and Tsai Ko entered into a Share Exchange Agreement (the “Ho-Cheng Insurance Agreement”). Ho-Cheng Insurance is a private company incorporated in Taiwan in 2001. At the December 29, 2016 closing of the Ho-Cheng Insurance Agreement, 250,000 shares of Longbau common stock, par value $0.00001 per share were issued to Ho-Cheng Insurance’s shareholders in exchange for 100% of Ho-Cheng Insurance’s issued and outstanding ownership interests (“Ho-Cheng Insurance Exchange Shares”). Upon completion of the foregoing transaction, Ho-Cheng Insurance became a wholly-owned subsidiary of Longbau. Ho-Cheng Insurance, a Taiwan based insurance intermediary company focuses on sales of life, property and casualty insurance products underwritten by insurance companies as well as insurance brokerage services. The company has been cooperating with many insurance companies operating in Taiwan to distribute a wide variety of insurance products to customers. Longbau was incorporated on December 23, 2013 under the laws of the state of Delaware. Our executive office is located at No.100-11, Sec.1, Zhongqing Rd., North Dist., Taichung City 404, Taiwan (R.O.C.). Our telephone number is +852 58059452. Our wholly owned subsidiary, Longbau Group Limited (“Longbau Hong Kong”) was founded on February 14, 2014 in Hong Kong, of China. In September 2014, we established another subsidiary in Taiwan, Longbau Taiwan, to provide death care consulting services and sell death care products across Taiwan. Longbau Taiwan is 100% owned by Longbau Hong Kong. On February 24, 2014, the Company issued 30,000,000 shares of its common stock to several non-U.S. investors in consideration for their cash investment of $150,000 in the Company. The investment amount of $150,000 has been contributed into the Company’s wholly-owned subsidiary Longbau Hong Kong on February 24, 2014 as capital contributions. The issuance was made pursuant to an exemption from registration contained in Regulation S under the Securities Act of 1933, as amended. On December 29, 2016, the Company issued 500,000 shares of its common stock to several non-U.S. investors in consideration for the 100% of the ownership of Long Bao Life and Ho-Cheng Insurance. The details of the transactions are described above. The issuance was made pursuant to an exemption from registration contained in Regulation S under the Securities Act of 1933, as amended. China is the only country in the world with more than 200 million elderly people and consequently is the biggest old age market. The government estimates that the rate of population aging in cities and towns of China would reach 60% in 2020, which indicates the demands for funeral industry services is likely to increase. We estimate that current China death care market size is around $10.3 billion and the average spending per death is around $1,100. The better the economy, the more spending in death care. China death care sector mainly included three subsectors: 1) manufacturing and marketing of funeral merchandise, 2) funeral services, 3) marketing and management of cemeteries. Funeral merchandise is a fully opened market and is subject to fierce competition. Crematorium is mainly run by government held entity. Approximately 50% of cemeteries are for-profit businesses and 50% are non-profit businesses. The leading death care companies in Hong Kong include Sino-Life Group Limited, Anxian Yuan China Holdings Limited, and SAGE International group limited. Taiwan insurance market is large, highly developed by most standards and still growing quite rapidly. In recent 10 years, the number of Taiwan insurance intermediaries has increased by 2% annually, which indicates that the demand for insurance intermediaries is increasing. An insurance intermediary mainly provides customers with consulting services and went on to replace insurance companies’ salespersons who could only sell insurance products of their own company. Instead, insurance intermediaries can distribute to customers a wide variety of insurance products underwritten by different insurance companies, which could better meet customers’ needs. Insurance intermediaries have market share of 20% in Taiwan life insurance brokerage market and 19% in Taiwan property and casualty insurance brokerage market. To ensure the high quality of our death care management consulting services and pre-need and at need funeral services, we have trained our staff to provide professional and personalized services. Utilizing our experience and expertise we will strive to help families and friends of the deceased get through the hardest time of their lives. We are planning to approach candidates who have experience in death care industry to join our team. Once these people are formally recruited, we are going to have systematic training over our associates. We are aiming to have our associates well-trained and capable of offering professional and personalized services to our customers. We will invest considerable capital and human resources in providing comprehensive associate training. Also, we educate and train our insurance salespersons regularly to ensure they provide our customers with accurate product information and high-quality services. We expect to derive revenues in multiple channels, including, without limitation, telephone sales, third-party sales agents, ecommerce, and corporate strategic partnerships and alliances. We are currently also approaching candidates who are specialized in marketing of death care and insurance industry and we will invest related capital and human resources in building our marketing team. We expect that with our commitment to high-quality services, combined with our multiple marketing channels, Longbau will gradually grow into a well-known brand in death care industry and insurance industry in the future and eventually tap its way to mainland China and other Asian countries. In 2018, we expect to provide consulting services to some companies in the death care industry to improve their operation performance. Secondly, we plan to expand our customer base both in the death care industry and insurance industry. Lastly, we plan to sell new funeral related products. In the future, the Company expects to promote the death care services and insurance products in mainland China. Given mainland China is the biggest old age market, we intend to cooperate with large companies and provide consulting services to small companies in death care industry. Traditionally, funeral owners selling death care services overlook the quality of corporate management. Our executive officers have extensive professional management experience and can solve our clients’ corporate management issues and provide the customer better a better experience using our experience in financial management, sales management, administration, and quality management. The Company’s services will be sold to independent death care service providers through in person contact, telephone calls, and through the internet. There are no current plans to sell services through brick and mortar storefronts. The Company plans to enter into consultant contracts with these service providers for negotiated fees. The Company, mainly through Long Bao Life, provides pre-need and at need funeral services. A pre-need death care contract enables a customer to make his/her own funeral arrangements in advance and prepay for the funeral, which reduces the burden of the family at the time of bereavement as well as avoids the influence of rising costs. Our subsidiary, Long Bao Life, sells funeral related products, such as urns, in Taiwan. Our subsidiary, Ho-Cheng Insurance, has been cooperating with many insurance companies operating in Taiwan to distribute a wide variety of insurance products to customers. Ho-Cheng Insurance sells our customers two broad categories of insurance products: life insurance products and property and casualty insurance products, both focused on meeting the particular insurance needs of individuals. The insurance products that Ho-Cheng Insurance sells are underwritten by some of the leading insurance companies in Taiwan. The life insurance products the Company distributes can be broadly classified into the categories set forth below. Due to constant product innovation by insurance companies, some of the insurance products the Company distributes combine features of one or more of the categories listed below. · Individual Whole Life Insurance. The individual whole life insurance products the Company distributes provide insurance for the insured person’s entire life in exchange for the periodic payment of fixed premiums over a pre-determined period, generally ranging from six to 20 years, or until the insured reaches a certain age. The face amount of the policy or, for some policies, the face amount plus accumulated interest is paid upon the death of the insured. · Individual Term Life Insurance. The individual term life insurance products the Company distributes provide insurance for the insured for a specified time period or until the attainment of a certain age, in return for the periodic payment of fixed premiums over a pre-determined period, generally ranging from six to 20 years. Term life insurance policies generally expire without value if the insured survives the coverage period. · Individual Health Insurance. The individual health insurance products the Company distributes pay the insured amount of reasonable hospitalization cost, or certain death benefit in case of the death of the insured, due to sickness, accident or childbirth. Individual health insurance policies expire when the premium is not paid or a certain age is attained. · Accidental Injury Insurance. Accidental Injury Insurance is the kind of accident and health insurance where benefit is given when the insured is dead or disabled because of accidental injury, which is unforeseen by the injured or against his will. Accidental Injury Insurance policies expire when the premium is not paid or a certain age is attained. · Investment-oriented Insurance. Investment-oriented insurance products are the market linked insurance plan which also provide life coverage. The premium amount (after deduction of certain charges) is invested into different funds. The performance of the fund will depend on the market. A growing upward trend in market will increase the fund value. Every investment-oriented insurance policy has market risk exposure depending on the fund invested and such investment risk is solely borne by the policyholder. Depending on the death benefit, investment-oriented insurance policies are categorized into two broad categories: (1) the death benefit is equal to the higher of insured amount or fund value; (2) the death benefit is equal to the insured amount plus fund value. · Foreign Currency Policy Commodity. It is a life insurance policy in which a policy benefit shall all be paid in foreign currencies. The foreign currency policy provides insurance for the insured person’s life in exchange for the periodic payment of fixed premiums over a pre-determined period, generally ranging from six to 20 years, or until the insured reaches a certain age. The face amount of the policy or, for some policies, the face amount plus accumulated interest, is paid upon the death of the insured. · Travel Accident Insurance. It is a kind of accident and health insurance. The travel accident insurance provides monetary compensation in case the insured dies or loses a limb in an accident while he or she is traveling. The premium is based on the days of traveling and the insured amount. The Company’s main property and casualty insurance products are automobile insurance, casualty insurance and liability insurance. · Automobile Insurance. The Company distributes both standard automobile insurance policies and supplemental policies, which we refer to as riders. The standard automobile insurance policies the Company sells generally have a term of one year and cover damages caused to the insured vehicle by collision and other traffic accidents, falling or flying objects, fire, explosion and natural disasters. The Company also sells standard third party liability insurance policies, which cover bodily injury and property damage caused by an accident involving an insured vehicle to a person not in the insured vehicle. The policy could also cover additional losses, such as liability to passengers, losses arising from vehicle theft and robbery, broken glass and vehicle body scratches. · Casualty Insurance. Casualty insurance is made to insure any loss or damage to property. This is designed to cover loss that is caused by direct accident. The policy period is usually one year. The premium is based on the insured amount. · Liability Insurance. When the insured is legally obligated to indemnify a third party and subject to a claim in connection therewith, the liability insurer is liable to provide such indemnification on behalf of the insured. The policy period is usually one year. The premium is based on the insured amount. · Commercial Property Insurance. The commercial property insurance products the Company distributes include basic, comprehensive and all risk policies. Basic commercial property insurance policies generally cover damage to the insured property caused by fire, explosion and thunder and lightning. Comprehensive commercial property insurance policies generally cover damage to the insured property caused by fire, explosion and certain natural disasters. All risk commercial property insurance policies cover all causes of damage to the insured property not specifically excluded from the policies. We currently have 50 employees to whom we are paying salaries. Depending on the business needs, we intend to recruit additional full-time employees in the future. As of December 31, 2017, we do not have any stock option plans. Longbau Hong Kong is a wholly owned subsidiary of Longbau Group, Inc. and Longbau Taiwan is a wholly owned subsidiary of Longbau Hong Kong. 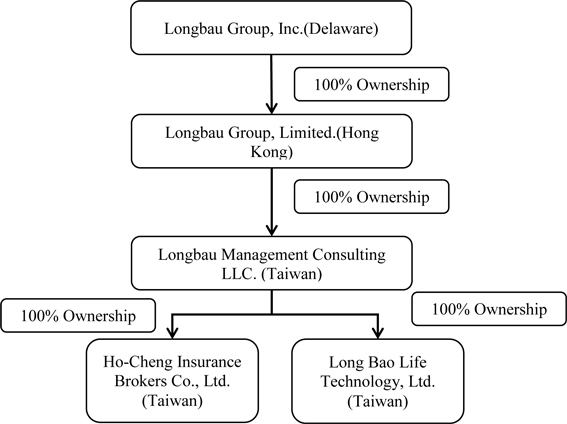 Long Bao Life and Ho-Cheng Insurance are wholly owned subsidiaries of Longbau Taiwan. The Company needs to comply with Regulations on Funeral and Interment Control of the People's Republic of China and Public Health and Municipal Service Ordinance of Hong Kong. Any management consulting relating to construction of funeral homes, funeral service stations, cinerary halls and cemeteries shall be subject to examination and approval of related departments of the governments. Handling of mortal remains and conducting of funeral activities shall observe the provisions of the regulations. Any management consulting relating to cemeteries, funeral halls and funeral services shall apply to the applicable regulations of Mainland China and Hong Kong. Those funeral and interment service personnel shall obey the provisions as well. Additional or more regulations of funeral industry of Mainland China and Hong Kong may be considered from time to time. We shall also comply with Funeral and Interment Laws of Taiwan, which mainly consist of the regulations of funeral services, management measures and penalty provisions of funeral home and regulations relating to equipment and land limitations of funeral home and crematoria. Insurance activities undertaken within Taiwan are primarily governed by the Insurance Act and the related rules and regulations and supervised by Financial Supervisory Committee in Taiwan, the FSC. The Insurance Act defines several subjects of insurance industry, such as insurer, insurance agency, insurance brokerage and insurance adjustor. It established requirements for form of organization, and qualifications and procedures to establish an insurance organization as well as separation of property insurance businesses and life insurance businesses. The insurers, insurance agencies, insurance brokerages and insurance adjustors must join the related industry associations, or they are prohibited from conducting business operation. The FSC is the competent authority responsible for supervising, regulating, and facilitating the development of financial market and financial services in Taiwan, including the insurance sector. An insurance agent stipulated under the Insurance Law refers to a person who is on behalf of the insurer to conduct agency business pursuant to the agency contract or the power of attorney and charges fees from the insurer. Depending on their focused insurance areas, i.e. property insurance and life insurance, insurance agents can be divided into property insurance agents and life insurance agents. No matter what insurance industry an insurance agent is engaged in, it must have one of the following qualifications: (1) having passed the insurance agency examination for professional and technical staff; (2) having passed the insurance agency qualification test; or (3) having obtained the agency practitioner certificate and practiced the same business. Those who have agent qualifications required by the Agent Rule may conduct business after they obtain the practitioner certificates under the name of themselves or the company they work for. An agency company must hire more than one agent to act as signatory (ies), and registered with the administrative authority, the number of whom can be adjusted appropriately in accordance with the scale of business. If necessary, the administrative authority may, in its discretion, require the company to add more signatories. An insurance agent may only work for one insurance agency company as signatory at one time. There are special requirements for agency companies, such as the name of an agent company must contain the words “insurance agency”, and when an agency company applies to operate agency business, the minimum registered capital must be at least $157,953 (Taiwan $5 million) fully paid up in cash, according to which, insurance agency companies with business license obtained prior to the implementation of this latest Agent Rule shall adjust their registered capital within five years upon the its implementation. The practitioner certificate has a duration of five years, and must be renewed before expiration. In case an agent has the qualifications for both of property and life insurance, unless otherwise approved by the administrative authority, only one kind of insurance agency practitioner certificate may be obtained upon his selection. There are two types of education and training for an insurance agent, pre-vocational and on-the-job education and training. An insurance agent must attend in pre-vocational education and training for at least 32 hours during the one year before applying for practicing insurance agency business and on-the-job education and training for at least 16 hours with law courses for no less than 8 hours per year, commencing after one year from the issuance of this latest Agent Rule. The rules describing how to conduct insurance agency business concentrate on the concept that the agencies must take care of customers' matters in good faith. To ensure this concept is properly carried out, the rules require insurance agency companies must have legal compliance officers with one of the following qualifications: (1) are qualified to be insurance agents or brokers and have worked as actual signatories; (2) have five years working experience in the insurance industry, insurance agency or insurance brokerage; or (3) having graduated from departments related to insurance or law departments of colleges and universities with more than three years working experience in insurance industry, insurance agency or insurance brokerage. An insurance broker stipulated under the Insurance Act refers to a person who negotiates to conclude an insurance contract on behalf of the insured and charges fees from the insured. Depending on their focused insurance areas, i.e. property or life insurance, insurance brokers can be divided into property insurance brokers and life insurance brokers. No matter what insurance industry an insurance broker is engaged in, it must have one of the following qualifications: (1) has passed the Examination for Professionals and Technical Personnel in the category of insurance broker; (2) Is on record as having previously passed a broker qualification test held by the competent authority; or (3) Has previously obtained a broker practice license and practiced thereunder. Those who have brokerage qualifications required by the Broker Rule may conduct business after they obtain the practitioner certificates under their own name or the company they work for. A brokerage company must hire more than one broker to act as signatory (ies), and registered with the administrative authority, the number of whom can be adjusted appropriately in accordance with the scale of business. If necessary, the administrative authority may, in its discretion, require the company to add signatories. An insurance broker may only work for one insurance brokerage company as signatory at one time. There are special requirements for brokerage companies, such as the name of an brokerage company must contain the words “insurance broker”; when an brokerage company applies to operate brokerage business, the minimum registered capital must be at least $157,953 (Taiwan $5 million) fully paid up in cash, according to which, insurance brokerage companies with business license obtained prior to the implementation of this latest Broker Rule shall adjust their registered capital within five years upon the its implementation. The insurance broker practitioner certificate has a validation duration of five years and must be renewed before expiration. In case a broker has the qualifications for both property insurance and life insurance, he may obtain both insurance brokerage practitioner certificates. There are two types of education and training for an insurance broker, pre-vocational and on-the-job education and training. An insurance broker must attend pre-vocational education and training for at least 32 hours during the one year before applying for practicing insurance broker business and on-the-job education and training for at least 16 hours with law courses for no less than 8 hours per year, commencing after one year from the issuance of this latest Broker Rule. The rules describing how to conduct brokerage business concentrate on the concept that the brokerages must take care of customers' matters in good faith. To ensure that this concept is properly carried out, the rules require insurance brokerage companies must have legal compliance officers who have one of the following qualifications: (1) Having the qualification of an insurance agent or broker and actually serving as a signatory; (2) Having at least five years of work experience in related business of insurance enterprise, insurance agent company or broker company; or (3) Having graduated from college with a degree in finance, insurance or related field, or a degree in law and having at least three years of work experience in related business of insurance enterprise, insurance agent company or broker company. The current principal regulation governing individual insurance salespersons is the Rules on the Administration of Insurance Salespersons latest amended on September 14, 2010 by Insurance Bureau of FSC (the “Salesperson Rule”). An insurance salesperson falling under the Insurance Law refers to a person who is engaged in attracting insurance business for insurance companies, insurance brokerage companies and insurance agency companies. A salesperson is not allowed to attract business for the company he belongs to unless he has completed the registration in accordance with the Salesperson Rules and has obtained the registration certificate. In order to obtain the registration certificate, an insurance salesperson must be at least 20 years old and has at least graduated from a senior high school or a senior vocational school or have an equivalent educational background. In addition, the salesperson must meet one of the following requirements: (1) passed the salesperson qualification examination held by relevant associations; or (2) have a valid the registration certificate. Once the salespersons passed the qualification examination, the relevant association will notify the company where the salesperson works, then the company will issue a registration certificate for the salesperson and file such registration certificate with the relevant authorities. The registration certificate is valid for five years and must be renewed before expiration. The salesperson must present the registration certificate before they start attracting insurance business. Unless approved by the company, the salesperson may not work for any other insurance company, insurance brokerage company or insurance agency company. The company supervises the work of the salesperson and is joint and severally liable for any damage caused by its salesperson. Salespersons must attend in education and training held by their companies every year, or the companies shall revoke the registration certificates of those who fail to attend such education and training. The Salesperson Rule also stipulates the proper ways and manners to be followed by the salespersons in conducting their businesses and specifies the penalties in case of their violation of the Salesperson Rule. · Taiwan suffers serious trade deficit. Before purchasing any of the shares of our common stock, you should carefully consider the following factors relating to our business and prospects. If any of the following risks actually occurs, our business, financial condition or operating results could be materially adversely affected. In such case, the trading price of our common stock could decline, and you may lose all or part of your investment. We have incurred losses and may continue to incur losses. We had consolidated net loss of $64,801 and $191,304 for the years ended December 31, 2017 and 2016 and we may continue to incur losses in the future. We expect our costs and expenses to increase as we expand our operations. Our ability to achieve and maintain profitability depends on the growth of our market share, the acceptance of our services by our customers, the competitiveness of our death care management consultant services, and our ability to control our costs and expenses. We may not be able to achieve or sustain profitability on a quarterly or an annual basis. We currently have 50 employees, and our operation is expanding. We generated approximately $7.6million revenues during the year ended December 31, 2017 and expect to generate more revenues in 2018 from funeral and insurance services. Our business and prospects could be materially and adversely affected if we are not able to manage our growth successfully. We are currently selling services in Hong Kong through Longbau Hong Kong, our operating company in Hong Kong, to small death care companies across Hong Kong, and we intend to expand business operations by distributing and exporting our consultancy services in 2018 through a variety of marketing channels. In September 2014, we established another subsidiary in Taiwan, Longbau Taiwan, to provide death care consulting service and sell death care products across Taiwan. We anticipate continued growth in the future through internal expansion as well as external strategic partnerships or alliances. Our expansion will place substantial demands on our managerial, operational, technological and other resources. To manage and support our continued growth, we must continue to improve our operational, administrative, financial and technological systems, procedures and controls, and expand, train and manage our growing employee base. We cannot assure you that our current and planned personnel, systems, procedures and controls will be adequate to support our future operations. Any failure to effectively and efficiently manage our expansion could materially and adversely affect our ability to capitalize on new business opportunities, which in turn could have a material adverse effect on our results of operations. The funeral home and cemetery industry continues to be increasingly competitive. In Asia, the funeral home and cemetery industry is characterized by a large number of locally-owned, independent operations. To compete successfully, our funeral service locations and cemeteries must maintain good reputations and high professional standards, as well as offer attractive services at competitive prices. In addition, we must market the Company in such a manner as to distinguish us from our competitors. If we are unable to successfully compete, our financial condition, results of operations, and cash flows could be materially adversely affected. Since our operations relate to life events involving emotional stress for our client families, our business is dependent on consumer trust and confidence. Unfavorable publicity about our business generally or in relation to any specific location could affect our reputation and consumers’ trust and confidence in our services, thereby having an adverse impact upon our sales and financial results as well as the price of our common stock. If the number of deaths in our markets declines, our cash flows and revenues may decrease. If the number of deaths declines, the number of funeral services and interments performed by us could decrease and our financial condition, results of operations, and cash flows could be materially adversely affected. If we are not able to respond effectively to changing consumer preferences, our market share, revenues and profitability could decrease. Future market share, revenues and profits will depend in part on our ability to anticipate, identify and respond to changing consumer preferences. We may not correctly anticipate or identify trends in consumer preferences, or we may identify them later than our competitors do. In addition, any strategies we may implement to address these trends may prove incorrect or ineffective. If we cannot explore various marketing channels for our products and services profitably, our planned future growth will be impeded, which would adversely affect sales. Our growth is dependent on increases in sales through our successful exploration of a variety of marketing channels. Our ability to timely expand our market share through a combination of marketing channels, including our consultancy services depends in part on the following factors: the availability of such channels; the ability to negotiate acceptable terms with third party service providers; the ability to identify customer demand in different geographic areas; the hiring, training and retention of competent sales personnel; the effective management of inventory to meet the needs of increased orders on a timely basis; general economic conditions; and the availability of sufficient funds for expansion. Many of these factors are beyond our control. Delays or failures in utilizing these marketing channels or achieving lower than expected sales through such marketing channels, could materially adversely affect our growth and profitability. Our future success depends on the continuing efforts of our senior management team and other key personnel, and our business may be harmed if we lose their services. Our future success depends heavily upon (i) the continuing services of our current senior management team and (ii) the recruitment of other key personnel, in particular the Chief Executive Officer. If we fail to recruit the key personnel, or one or more of our senior management team, are unable or unwilling to continue in their present positions, we may not be able to replace them easily, or at all. As such, our business may be disrupted, and our financial condition and results of operations may be materially and adversely affected. Competition for senior management and key personnel is intense, the pool of qualified candidates is very limited, and we may not be able to retain the services of our senior executives or key personnel or attract and retain high-quality senior executives or key personnel in the future. As is customary in Hong Kong and Taiwan, we do not have insurance coverage for the loss of our senior management team or other key personnel. In addition, if any member of our senior management team or any of our other key personnel joins a competitor or forms a competing company, we may lose customers, sensitive trade information and key professionals and staff members. If we fail to maintain an effective system of internal controls over financial reporting, we may not be able to accurately report our financial results or prevent fraud. We are subject to reporting obligations under U.S. securities laws. Pursuant to Section 404 of the Sarbanes-Oxley Act of 2002 and the related rules adopted by the Securities and Exchange Commission, every public company is required to include a management report on the company’s internal controls over financial reporting in its annual report, which contains management’s assessment of the effectiveness of the company’s internal controls over financial reporting. There is no assurance that we will be able to maintain effective internal controls over financial reporting in the future. If we fail to do so, we may not be able to produce reliable financial reports and prevent fraud. Moreover, if we were not able to conclude that we have effective internal controls over financial reporting, investors may lose confidence in the reliability of our financial statements, which would negatively impact the trading price of our shares. Our reporting obligations as a public company, including our efforts to comply with Section 404 of the Sarbanes-Oxley Act, will continue to place a significant strain on our management, operational and financial resources and systems for the foreseeable future. Our network and communications systems are dependent on third-party providers and are vulnerable to system interruption and damage, which could limit our ability to operate our business and could have a material adverse effect on our business, financial condition or results of operations. We intend to expand sales of our services through a variety of marketing channels, among which include telephone sales, in and eventually out of Hong Kong and Taiwan, third-party sales agents, ecommerce, and corporate strategic partnerships and alliances. Our systems and operations and those of our third-party Internet and telecommunication service providers, are vulnerable to damage or interruption from fire, flood, earthquakes, power loss, server failure, telecommunications and Internet service failure, acts of war or terrorism, computer viruses and denial-of-service attacks, physical or electronic breaches, sabotage, human error and similar events. Any of these events could lead to system interruptions, processing and order fulfillment delays, and loss of critical data for us, our suppliers, or our Internet service providers, and could prevent us from processing customer purchases. Any significant interruption in the availability or functionality of our website or our customer processing, distribution, or communications systems, for any reason, could seriously harm our business, financial condition, and operating results. The occurrence of any of these factors could have a material adverse effect on our business, financial condition or results of operations. If we fail to attract and retain productive sales professionals or agents, our business could suffer. Our entire sales of life, property and casualty insurance products are conducted through our individual sales professionals or agents, who are not our employees. Some of these sales professionals or sales agents are significantly more productive than others in generating sales. If we are unable to attract and retain the core group of highly productive sales professionals or sales agents, our business could be materially and adversely affected. Competition for sales personnel from insurance companies and other insurance intermediaries may also force us to increase the compensation of our sales professionals or sales agents, which would increase operating costs and reduce our profitability. Competition in insurance industry is intense and, if we are unable to compete effectively, we may lose customers and our financial results may be negatively affected. The insurance intermediary industry in Taiwan and China is highly competitive, and we expect competition to persist and intensify. In insurance product distribution, we face competition from insurance companies that use their in-house sales force and exclusive sales agents to distribute their products, and from business entities that distribute insurance products on an ancillary basis, such as commercial banks, postal offices and automobile dealerships, as well as from other professional insurance intermediaries. Many of our competitors have greater financial and marketing resources than we do and may be able to offer products and services that we do not currently offer and may not offer in the future. If we are unable to compete effectively against those competitors, we may lose customers and our financial results may be negatively affected. Because the commission and fee revenue we earn on the sale of insurance products is based on premiums and commission and fee rates set by insurance companies, any decrease in these premiums or commission and fee rates may have an adverse effect on our results of operations. We are engaged in the insurance agency and brokerage business and derive revenues primarily from commissions and fees paid by the insurance companies whose policies our customers purchase. The commission and fee rates are set by insurance companies and are based on the premiums that the insurance companies charge. Commission and fee rates and premiums can change based on the prevailing economic, regulatory, taxation-related and competitive factors that affect insurance companies. These factors, which are not within our control, include the ability of insurance companies to place new business, underwriting and non-underwriting profits of insurance companies, consumer demand for insurance products, the availability of comparable products from other insurance companies at a lower cost, the availability of alternative insurance products such as government benefits and self-insurance plans, as well as the tax deductibility of commissions and fees and the consumers themselves . We may require additional funds to continue our business plan. Our business plan and growth strategy call for ongoing expenses in connection with the distribution of our death care services. As of December 31, 2017, we had $564,561 cash on hand and we have accumulated a deficit of $1,006,595. Although the Company believes it will not need to raise additional funding to expand its business operations over the next 12 months, there is no guarantee additional funding will not be required. If financing is needed and we are not able to raise the capital necessary to fund our business expansion objectives, we may have to delay the implementation of our business plan. We do not currently have any arrangements for financing. Obtaining additional funding will be subject to a number of factors, including general market conditions, investor acceptance of our business plan and initial results from our business operations. These factors may impact the timing, amount, terms or conditions of additional financing available to us. The most likely source of future funds available to us is through the sale of additional shares of common stock or advances from our major shareholders or directors and, if we are able to obtain equity financing, it will likely result in significant additional dilution to the interests of our current stockholders and may include liquidation or other preferences that adversely affect your right as a stockholder. The Company may obtain financing by issuing debt which may involve agreements that include covenants limiting or restricting our ability to take specific actions, such as incurring additional debt, making capital expenditures or declaring dividends. There can be no assurance that we will be able to obtain such additional financing if needed and if we cannot receive such financing we may be forced to suspend or cease operations. General economic conditions, including a prolonged weakness in the economy, may affect consumer purchases, which could adversely affect our sales. Due to the nature of our products and services, our sales results are dependent on a number of factors impacting consumer spending, including general economic and business conditions; consumer confidence; wages and employment levels; the housing market; consumer debt levels; availability of consumer credit; credit and interest rates; taxes; general political conditions, both domestic and abroad. Consumer product purchases, including purchases of our services, may decline during recessionary periods. A prolonged downturn or an uncertain outlook in the economy may materially adversely affect our business and our revenues and profits. We have never paid any dividends on our common stock. We do not expect to pay cash dividends on our common stock at any time in the foreseeable future. The future payment of dividends directly depends upon our future earnings, capital requirements, financial requirements and other factors that our board of directors will consider. Since we do not anticipate paying cash dividends on our common stock, return on your investment, if any, will depend solely on an increase, if any, in the market value of our common stock. We are an Emerging Growth Company as defined under the Jumpstart Our Business Startups Act. · The date on which the issuer is deemed to be a “large accelerated filer” under the Exchange Act, which means, among other things, that it has a public float in excess of $700 million. Pursuant to the Jumpstart Our Business Startups Act of 2012 (the “JOBS Act”), as an emerging growth company the Company can elect to opt out of the extended transition period for any new or revised accounting standards that may be issued by the PCAOB or the SEC. The Company has elected not to opt out of such extended transition period which means that when a standard is issued or revised and it has different application dates for public or private companies, the Company, as an emerging growth company, can adopt the standard for the private company. This may make comparison of the Company's financial statements with any other public company which is not either an emerging growth company nor an emerging growth company which has opted out of using the extended transition period difficult or impossible as possible different or revised standards may be used. The Company has elected to use the extended transition period for complying with new or revised financial accounting standards available under Section 102(b)(2)(B) of the JOBS Act. Among other things, this means that the Company's independent registered public accounting firm will not be required, as with smaller reporting companies, to provide an attestation report on the effectiveness of the Company's internal control over financial reporting so long as it qualifies as an emerging growth company, which may increase the risk that weaknesses or deficiencies in the internal control over financial reporting go undetected. Likewise, so long as it qualifies as an emerging growth company, the Company may elect not to provide certain information, including certain financial information and certain information regarding compensation of executive officers that would otherwise have been required to provide in filings with the SEC, which may make it more difficult for investors and securities analysts to evaluate the Company. As a result, investor confidence in the Company and the market price of its common stock may be adversely affected. As long as we remain a Smaller Reporting Company, we may take advantage of certain scaled or reduced disclosure requirements, some of which are the same as the reduced disclosure requirements applicable to an Emerging Growth Company. In the event that we cease to be an Emerging Growth Company as a result of a lapse of the five year period, but continue to be a Smaller Reporting Company, we would continue to take advantage of the scaled disclosure requirements applicable to a Smaller Reporting Company. Our operations and financial results could be severely harmed by natural disasters. Our executive office is located in Taiwan, which is susceptible to earthquakes. Taiwan is also exposed to typhoons and tsunamis. If a major earthquake, typhoon, tsunami or other natural disaster were to affect the operations of our suppliers and manufacturers, our sales and delivery of products to our customers could be interrupted or delayed. As a result, our normal business operations could be severely disrupted and our financial condition and results of operations could be adversely affected. Our primary operation is located in Taiwan, and because the rights of shareholders under Taiwan law differ from those under U.S. law, you may have difficulty protecting your shareholder rights. We conduct all of our business operations through our operating entity in Taiwan, whose corporate affairs are governed by its Articles of Incorporation and by the laws governing corporations incorporated in Taiwan. The rights of shareholders and the responsibilities of management and the members of the board of directors under Taiwan law are different from those applicable to a corporation incorporated in the United States. For example, directors and controlling shareholders of Taiwan companies do not owe fiduciary duties to minority shareholders.. Therefore, public shareholders of Taiwan companies may have more difficulty in protecting their interest in connection with actions taken by management or members of the board of directors than they would as public shareholders of a U.S. corporation. U.S. investors may experience difficulties in attempting to effect service of process and to enforce judgments based upon U.S. federal securities laws against the company and its non-U.S. resident directors and senior officers. All of our directors and senior officers are non-residents of the United States. Consequently, it may be difficult for investors to effect service of process on any of them in the United States and to enforce judgments obtained in United States courts against them based on the civil liability provisions of the United States securities laws. Since all our assets are located in Hong Kong and Taiwan it may be difficult or impossible for U.S. investors to collect a judgment against us. As well, any judgment obtained in the United States against us may not be enforceable in the United States. Extensive regulation of our industry may limit our flexibility to respond to market conditions and competition, and our business may suffer. We operate our insurance agency and brokerage business in Taiwan through our operating entity Ho-Cheng Insurance. As an insurance agency and brokerage service provider in Taiwan, Ho-Cheng Insurance is subject to extensive regulation. As revenue generated by Ho-Cheng Insurance constitutes a substantial part of our revenue, any changes in the regulatory environment applicable to Ho-Cheng Insurance may adversely affect our business, financial condition and results of operations. Currently Ho-Cheng Insurance’s principal regulator is the Financial Supervisory Committee in Taiwan, or the FSC, which was formed on July 1, 2004 in accordance with the Financial Supervisory Organization Act, which was intended to grant regulatory authority over the Taiwan insurance industry to the FSC. We operate our pre-need funeral services business in Taiwan through Long Bao Life. Pre-need funeral service providers are also strictly regulated in Taiwan. See “Item 1.Business—Regulation” for a discussion of the regulatory environment applicable to Ho-Cheng Insurance and Long Bao Life. The Company’s headquarters is located in Chuanghua, Taiwan. The Company leased offices in cities throughout Taiwan, including offices leased from its officers and directors. On December 30, 2014, the Company entered into a land purchase agreement with a third-party individual. Pursuant to the agreement, the Company agreed to purchase 1,296 square feet of land in Tauyuan, Taiwan for $1,972,063 (Taiwan $62,600,000). The title of the land has been transferred to the Company with the ownership certificate held in escrow until total proceeds are paid. The land is currently still a collateral to a bank for the seller's outstanding borrowing. Our common stock has been quoted on the Over the Counter Bulletin Board (“OTCBB”) under the symbol “LNGB” since March 25, 2015. The following table sets forth for the respective periods indicated the high and low closing prices for the common stock, as reported by the OTCBB. Such prices are based on inter-dealer bid and asked prices, without markup, markdown, commissions, or adjustments and may not represent actual transactions. On June 1, 2018, there were approximately 330 holders of record of our common stock. The holders of our common stock are entitled to receive dividends when, as and if declared by the board of directors out of funds legally available therefore. To date, we have not declared nor paid any cash dividends. The board of directors does not intend to declare any dividends in the foreseeable future, but instead intends to retain all earnings, if any, for use in our business operations. No securities are authorized for issuance by the Company under equity compensation plans. We did not repurchase any of our equity securities that were registered under Section 12 of the Securities Act during the year ended December 31, 2017. You should read this Management’s Discussion and Analysis in conjunction with the consolidated financial statements and related notes. This discussion contains forward-looking statements that reflect our plans, estimates and beliefs. Our actual results may differ materially from those anticipated in these forward-looking statements. We provide consulting services related to pre-need death care through consultancy contracts with small death care service providers in Taiwan. Also, the Company actively sells pre-need death care contracts and insurance products through its own sales force in Taiwan. We consult on the purchase of cemetery property and funeral and cemetery merchandise and services at the time of need and on a preneed basis. In addition, the Company specializes in the consultancy for deferred preneed funeral and cemetery receipts held in trust, preneed cemetery activities, preneed funeral activities, preneed funeral and cemetery, burial vaults, cemetery property, and cemetery property revenue. Long Bao Life provides “pre-need” and “at need” funeral services and sells funeral related products, such as urns, in Taiwan. A pre-need death care contract enables a customer to make his/her own funeral arrangements in advance and prepay for the funeral, which reduces the burden of the family at the time of bereavement as well as avoids the influence of rising costs. In addition, the company provides consulting services to customer prior to the purchase. Long Bao Life utilizes various systems, including multi-level marketing ("MLM") system, to sell the preneed contracts and other products. Under the MLM system, the salespeople are compensated not only for sales they generate, but also for the sales of the other salespeople that they recruit. This recruited sales force is referred to as the participant's "downline” and can provide multiple levels of compensation. MLM is one type of direct selling. The salespeople are expected to sell products directly to consumers by means of relationship referrals and word of mouth marketing. MLM salespeople not only sell the Long Bao Life products but also encourage others to join Long Bao Life as a distributor. Long Bao Life also sells its preneed contracts and other products through agents where it pays a fixed amount of commission. Revenues. For the year ended December 31, 2017, we generated revenues of $7,573,353 as compared to $7,986,658 for the year ended December 31, 2016, a decrease of $413,305 or 5%. Revenues from our funeral services segment decreased by $105,072 or 7% from $1,558,830 in 2016 to $1,453,758 in 2016. The decrease is principally due to reduced volumes in sales of urns. Revenues from our insurance segment decreased by $308,233 or 5% from $6,427,828 in 2017 to $6,119,595 in 2016. The decrease is principally due to reduced volumes in sales of insurance products. We did not generate any revenues from our consulting business during either 2017 or 2016. Cost of revenues. For the year ended December 31, 2017, our cost of revenues was $5,791,325 as compared to $5,996,677 for the year ended December 31, 2016, a decrease of $205,352 or 3%. The decrease is principally due to the decrease in urn sales and the increase of commission paid to insurance agents. General and administrative expenses. For the year ended December 31, 2017, we had general and administrative expenses of $1,693,105 as compared to $2,031,138 for the year ended December 31, 2016, an increase of $338,033 or 17%. As a percentage of revenues, our general and administrative expenses for the years ended December 31, 2017 and 2016 were 22% and 25% respectively. The decrease in both dollars and percentage is due to us managing our operating expense better and reduction of unnecessary costs. Other income (expense). For the year ended December 31, 2017, we had other income of $60,276 as compared to $46,482 for the year ended December 31, 2016, an increase of $13,794 or 30%. The increase is principally due to higher realized and unrealized losses on our trust investments in 2017 as compared to 2016. Net Income. For the year ended December 31, 2017, we had a net loss of $64,801 as compared to a net loss of $191,304 for the year ended December 31, 2016, a decrease in net loss of $126,503. The change in net loss is due to factors discussed above. During the year ended December 31, 2017, Ho-Cheng received a capital contribution of $92,841 from a shareholder and the proceeds were used to fund our operations. We plan to fund our operations from loans from our major shareholders and we may raise equity capital by offering shares of our common stock to investors. As of December 31, 2017, we had cash on hand of $564,561. Operating activities. For the year ended December 31, 2017, we generated cash from operating activities of $24,639 as compared to $3,549 for the year ended December 31, 2016. The increase is principally due to changes in operating assets and liabilities. Investing activities. For the year ended December 31, 2017, we used cash in investing activities of $33,290 as compared to $52,052 for the year ended December 31, 2016. The decrease is principally due to lower purchases of property and equipment in 2017.
Financing activities. For the year ended December 31, 2017, we used cash of $205,913 in financing activities as compared to cash of $51,321 used in financing activities for the year ended December 31, 2016. The increase is principally due to the proceeds from capital contributions of $92,841 in 2017 compared to none in 2016. We plan to fund our operations from loans from our major shareholders and we may raise equity capital by offering shares of our common stock to investors as well as from our operations. Although the Company believes its revenues from operations will eliminate the need to raise additional funding to expand its business operations over the next 12 months, there is no guarantee additional funding will not be required. If financing is needed and we are not able to raise the capital necessary to fund our business expansion objectives, we may have to delay the implementation of our business plan. We do not currently have any arrangements for financing or immediate plans to raise funding. Obtaining additional funding will be subject to a number of factors, including general market conditions, investor acceptance of our business plan and initial results from our business operations. These factors may impact the timing, amount, terms or conditions of additional financing available to us. The most likely source of future funds available to us is through the sale of additional shares of common stock or advances from our major shareholders or directors and, if we are able to obtain equity financing, it will likely result in significant additional dilution to the interests of our current stockholders and may include liquidation or other preferences that adversely affect your right as a stockholder. The Company may obtain financing by issuing debt which may involve agreements that include covenants limiting or restricting our ability to take specific actions, such as incurring additional debt, making capital expenditures or declaring dividends. There can be no assurance that we will be able to obtain such additional financing is needed and if we cannot receive such financing we may be forced to suspend or cease operations. The preparation of consolidated financial statements in conformity with U.S. GAAP requires management to make estimates and assumptions that affect the reported amounts of assets and liabilities and disclosure of contingent assets and liabilities at the date of the consolidated financial statements and the reported amounts of revenues and expenses during the reporting period. The Company regularly evaluates estimates and assumptions related to allowance for sales return and deferred income tax asset valuation allowances. The Company bases its estimates and assumptions on current facts, historical experience and various other factors that it believes to be reasonable under the circumstances, the results of which form the basis for making judgments about the carrying values of assets and liabilities and the accrual of costs and expenses that are not readily apparent from other sources. The actual results experienced by the Company may differ materially and adversely from the Company’s estimates. To the extent there are material differences between the estimates and the actual results, future results of operations will be affected. Inventory is valued at the lower of the inventory’s cost or net realizable value. Management compares the cost of inventory with its market value and an allowance is made to write down inventory to the net realizable value, if lower. As of December 31, 2017 and 2016, there was no allowance for slow moving or obsolete inventory. Pursuant to Taiwanese law, 75% of the proceeds from preneed sales of merchandise and services are put into trust until such time that the Company meets the requirements for releasing trust amount, which is generally when the service and merchandise are delivered, when the preneed contract is canceled and when the balance of the trust fund exceeds 75% of the proceeds from sales of preneed contracts. The legal beneficiary of the trust is the Company and the trust is managed by the Company. The investments of such trust funds are classified as trading securities and are reported at fair market value; therefore, the unrealized gains and losses are included in the statement of operations. Targets that the trust fund can invest in are regulated by the authorities. On an annual basis, the Company is obligated to fund any shortfall if the amounts deposited by the customer exceed the funds in trust, including all investment income. The Company defers certain direct costs related to the acquisition of new preneed contracts. Such costs are expensed as the revenues are recognized. As of December 31, 2017 and 2016, the Company had $955,866 and $1,036,206 of deferred commission costs, respectively. The Company sells preneed contracts whereby the customer enters into arrangements for future merchandise and services prior to the time of need. As these contracts are entered into prior to the delivery of the related merchandise and services, the amount collected in advance is recorded in deferred preneed contract revenues. If a preneed contract is terminated upon a customer’s request, a refund equal to total amount collected by the Company minus 20% of the contract price will be made when the termination is not made within 14 days from the contract initiation date. Full refund will be made when the termination is made within 14 days. We do not record accounts receivable in accordance with the contractual payment date given the nature of our merchandise and services, the nature of our contracts with customers, and the timing of the delivery of our services. The Company also offers its merchandise and provides funeral hosting services on a stand-alone at need basis. The amount collected from customer before the merchandises and services are delivered is recorded in deferred revenues on the balance sheet. The Company uses the asset and liability method of accounting for income taxes, whereby deferred tax assets are recognized for deductible temporary differences, and deferred tax liabilities are recognized for taxable temporary differences. Temporary differences are the differences between the reported amounts of assets and liabilities and their tax bases. Deferred tax assets are reduced by a valuation allowance when, in the opinion of management, it is more likely than not that some portion, or all of, the deferred tax assets will not be realized. Deferred tax assets and liabilities are adjusted for the effects of changes in tax laws and rates on the date of enactment. A tax position is recognized as a benefit only if it is “more likely than not” that the tax position would be sustained in a tax examination, with a tax examination being presumed to occur. The amount recognized is the largest amount of tax benefit that is greater than 50% likely of being realized on examination. For tax positions not meeting the “more likely than not” test, no tax benefit is recorded. The Company recognizes revenue when the price is fixed or determinable, persuasive evidence of an arrangement exists, the services have been provided, and collectability is assured. Long Bao Life sells its merchandise and services on both a preneed and at need basis. At need sales are recognized as revenue when the service is performed or merchandise is delivered. Pre-need funeral services and funeral merchandise are under contracts that provide for delivery of the services and merchandise at the time of need. Revenue associated with sales of preneed funeral contracts is deferred until funeral merchandise is delivered or the funeral services are performed, generally at the time of need. Pursuant to Taiwanese law, 75% of the proceeds from funeral merchandise or services sold on a preneed basis is required to be paid into trust funds. Ho-Cheng Insurance’s revenue is from insurance agency and brokerage services. The Company sells insurance products to customers, and obtains commissions from the respective insurance carriers according to the terms of each insurance company service agreement. The Company recognizes revenue when the following have occurred: persuasive evidence of an agreement between the insurance company and insured exists, services were provided, the fee for such services is fixed or determinable and collectability of the fee is reasonably assured. Insurance agency services are considered complete, and revenue is recognized, when an insurance policy becomes effective. The Company recognizes revenue from insurance carriers on a gross basis. The commission paid by the Company to its agents are recorded as cost of revenues. In May 2014, the FASB issued Accounting Standards Update (“ASU”) 2014-09, Revenue from Contracts with Customers. The new standard supersedes nearly all existing revenue recognition guidance under U.S. GAAP. The core principle of ASU 2014-09 is to recognize revenues in a way that depicts the transfer of promised goods or services to customers in an amount that reflects the consideration to which the entity expects to be entitled to in exchange for those goods or services. ASU 2014-09 defines a five-step process to achieve this core principle and, in doing so, it is possible that more judgment and estimates may be required within the revenue recognition process than is required under present U.S. GAAP. These may include identifying performance obligations in the contract, estimating the amount of variable consideration to include in the transaction price, and allocating the transaction price to each separate performance obligation. The new standard also requires additional disclosure about the nature, amount, timing and uncertainty of revenue and cash flows arising from customer contracts, including significant judgments and changes in judgments. We adopted this new standard on January 1, 2018 using the modified retrospective method of adoption. The adoption of this standard did not have a material effect on our financial position, results of operations or cash flows, but will result in increased disclosures related to revenue recognition policies and disaggregation of revenues. In February 2016, the FASB issued ASU 2016-02, Leases, which aims to make leasing activities more transparent and comparable and requires substantially all leases be recognized by lessees on their balance sheet as a right-of-use asset and corresponding lease liability, including leases currently accounted for as operating leases. This ASU is effective for all interim and annual reporting periods beginning after December 15, 2019, with early adoption permitted. We expect to adopt ASU 2016-02 beginning January 1, 2019 and are in the process of assessing the impact that this new guidance is expected to have on our financial statements and related disclosures. In September 2016, the FASB issued ASU 2016-13, Financial Instruments-Credit Losses. ASU 2016-13 was issued to provide more decision-useful information about the expected credit losses on financial instruments and changes the loss impairment methodology. ASU 2016-13 is effective for reporting periods beginning after December 15, 2019 using a modified retrospective adoption method. A prospective transition approach is required for debt securities for which an other-than-temporary impairment had been recognized before the effective date. The Company is currently assessing the impact this accounting standard will have on its financial statements and related disclosures. In May 2017, the FASB issued ASU 2017-09, Modification Accounting for Share-Based Payment Arrangements. The standard amends the scope of modification accounting for share-based payment arrangements and provides guidance on the types of changes to the terms or conditions of share-based payment awards to which an entity would be required to apply modification accounting under ASC 718. The new standard is effective for fiscal years beginning after December 15, 2017. There was no impact on the financial statements of adopting this new standard on January 1, 2018. We do not expect adoption of any other new accounting pronouncements will have a material effect on the Company’s financial statements. We have audited the accompanying consolidated balance sheets of Longbau Group, Inc. (the "Company") as of December 31, 2017 and 2016, the related consolidated statements of operations and comprehensives loss, changes in shareholders’ equity (deficit) and cash flows, for each of the two years in the period ended December 31, 2017, and the related notes and schedules (collectively referred to as the "financial statements"). In our opinion, the financial statements present fairly, in all material respects, the consolidated financial position of the Company as of December 31, 2017 and 2016, and the consolidated results of its operations and its consolidated cash flows for each of the two years in the period ended December 31, 2017, in conformity with generally accepted accounting principles. The accompanying financial statements have been prepared assuming that the Company will continue as a going concern. As discussed in Note 3 to the financial statements, the Company has suffered recurring losses from operations, has a substantial working capital deficiency and substantial accumulated deficits and comprehensive loss that raise substantial doubt about its ability to continue as a going concern. Management's plans regarding these matters are also described in Note 2. The financial statements do not include any adjustments that might result from the outcome of this uncertainty. Longbau Group, Inc. (the Company) was incorporated in the State of Delaware on December 23, 2013.
Business operations include sales of life, property and casualty insurance products underwritten by insurance companies as well as insurance brokerage services and consulting for other providers of deferred preneed funeral and cemetery services, preneed cemetery and funeral activities, sales of burial vaults, urns and other funeral related and consumer products and cemetery property. Operating subsidiaries include Long Bao Life Technology Co., Ltd. (Long Bao Life) and Ho-Cheng Insurance Brokers Co., Ltd. (Ho-Cheng Insurance). Long Bao Life provides “pre-need” and “at need” funeral services and sells funeral related products, such as urns, in Taiwan. A pre-need death care contract enables a customer to make his/her own funeral arrangements in advance and prepay for the funeral, which reduces the burden of the family at the time of bereavement as well as avoids the influence of rising costs. In addition, the Company provides consulting services to customers prior to the purchase. Ho-Cheng Insurance, an insurance intermediary company, focuses on sales of life, property and casualty insurance products underwritten by insurance companies as well as insurance brokerage services. Ho-Cheng Insurance has been cooperating with many insurance companies operating in Taiwan to distribute a wide variety of insurance products to customers. The accompanying consolidated financial statements were prepared in conformity with accounting principles generally accepted in the United States of America (“U.S. GAAP”). The Company’s functional currency is the Taiwanese Dollar (“Taiwanese $” or “NT$”); however, the accompanying consolidated financial statements were translated and presented in United States Dollars (“$” or “USD”). The accompanying consolidated financial statements include the accounts of the Company and its wholly-owned subsidiaries. All significant intercompany transactions and balances were eliminated in consolidation. The accounts of the Company are maintained in the Taiwanese Dollar $. The accounts of the Company are translated into USD $ with the Taiwanese Dollar $ as the functional currency. All assets and liabilities are translated at the exchange rate on the balance sheet date, stockholders’ equity transactions are translated at the historical rates, and statement of operations items are translated at the weighted average exchange rate for the period. The resulting translation adjustments are reported under other comprehensive income. Gains and losses resulting from the translations of foreign currency transactions and balances are reflected in the statement of operations and comprehensive gain (loss). Accounts receivable are recorded, net of allowance for doubtful accounts and sales returns. Management reviews the composition of accounts receivable and analyzes historical bad debts, customer concentration, customer credit worthiness, current economic trends and changes in customer payment patterns to determine if the allowance for doubtful accounts is adequate. An estimate for doubtful accounts is made when collection of the full amount is no longer probable. Delinquent account balances are written-off after management has determined that the likelihood of collection is not probable and known bad debts are written off against the allowance for doubtful accounts when identified. The Company provides merchandise return policy where customers who return the merchandises or cancel the contracts can receive full refund or partial refund of the amount paid within 180 days from date of purchase and contracts. Allowance for sales return is established based on management’s estimates of expected returns and historical experiences. As of December 31, 2017 and 2016, there was no allowance for uncollectible accounts receivable. Inventory consists of funeral related products such as burial urns and other consumer products and is valued at the lower of cost as determined on a first-in first-out basis or net realizable value. Burial urns are processed for the Company by third party contractors to add paint and other decorative finishes. Unprocessed urns are carried as raw materials, processed urns are carried as finished goods. The cost of processing is added to the carrying value of finished goods. Management compares the cost of inventory with its market value and an allowance is made to write down inventory to the net realizable value if required. For certain of the Company’s financial instruments, including cash and equivalents, accounts receivable, accounts payable, and accrued expenses, the carrying amounts approximate their fair values due to their short maturities. · Level 1 inputs to the valuation methodology are quoted prices for identical assets or liabilities in active markets. · Level 2 inputs to the valuation methodology include quoted prices for similar assets and liabilities in active markets, quoted prices for identical or similar assets in inactive markets, and inputs that are observable for the asset or liability, either directly or indirectly, for substantially the full term of the financial instrument. · Level 3 inputs to the valuation methodology use one or more unobservable inputs which are significant to the FV measurement. the statement of operations. Targets that the trust fund can invest in are regulated by the authorities. On an annual basis, the Company is obligated to fund any shortfall if the amounts deposited by the customer exceed the funds in trust, including all investment income. The Company capitalizes the acquisition cost of its patent and amortizes the capitalized patent costs over 14 years..
Impairment losses are recorded on long-lived assets used in operations when indicators of impairment are present and the undiscounted cash flows estimated to be generated by those assets are less than the assets’ carrying amounts. In that event, a loss is recognized based on the amount by which the carrying amount exceeds the fair value of the long-lived assets. Loss on long-lived assets to be disposed of is determined in a similar manner, except that fair values are reduced to recognize the cost of disposal. Based on its review, the Company believes that as of December 31, 2017 and 2016, respectively, there was no significant impairment of its long-lived assets. A tax position is recognized as a benefit only if it is “more likely than not” that the tax position would be sustained in a tax examination, with a tax examination being presumed to occur. The amount recognized is the largest amount of tax benefit that is greater than 50% likely of being realized on examination. For tax positions not meeting the “more likely than not” test, no tax benefit is recorded. The Company has no uncertain tax positions as of December 31, 2017 and 2016. The Company recognizes revenue when the price is fixed, or determinable, persuasive evidence of an arrangement exists, the services have been provided, and collectability is assured. Long Bao Life sells its merchandise and services on both a preneed and at need basis. At need sales are recognized as revenue when the service is performed, or merchandise is delivered. Pre-need funeral services and funeral merchandise are under contracts that provide for delivery of the services and merchandise at the time of need. Revenue associated with sales of preneed funeral contracts is deferred until funeral merchandise is delivered or the funeral services are performed, generally at the time of need. Pursuant to Taiwanese law, 75% of the proceeds from funeral merchandise or services sold on a preneed basis is required to be paid into trust funds. Ho-Cheng Insurance’s revenue is from insurance agency and brokerage services. The Company sells insurance products to customers and obtains commissions from the respective insurance carriers according to the terms of each insurance company service agreement. The Company recognizes revenue when the following have occurred: persuasive evidence of an agreement between the insurance company and insured exists, services were provided, the fee for such services is fixed or determinable and collectability of the fee is reasonably assured. Insurance agency services are considered complete, and revenue is recognized, when an insurance policy becomes effective. The Company recognizes revenue from insurance carriers on a gross basis. The commission paid by the Company to its agents are recorded as cost of revenues. Basic earnings per share (“EPS”) is based on the weighted average number of common shares outstanding. Diluted EPS is based on the assumption that all dilutive securities are converted. Dilution is computed by applying the treasury stock method. Under this method, options and warrants are assumed to be exercised at the beginning of the period (or at the time of issuance, if later), and as if funds obtained thereby were used to purchase common stock at the average market price during the period. There were no potentially dilutive securities outstanding during the periods presented. US GAAP generally requires recognized revenue, expenses, gains and losses be included in net income. Certain statements, however, require entities to report specific changes in assets and liabilities, such as gain or loss on foreign currency translation, as a separate component of the equity section of the balance sheet. Such items, along with net income, are components of comprehensive income. The functional currency of the Company is the Taiwanese Dollar $. Translation loss of $6,420 and $21 at December 31, 2017 and 2016, respectively, are classified as an item of other comprehensive income in the stockholders’ equity section of the balance sheet. The Company uses the “management approach” model for segment reporting. The management approach model is based on the way a company’s management organizes segments within the company for making operating decisions and assessing performance. Cash flows from the Company’s operations are calculated based upon the local currencies using the average translation rates. As a result, amounts related to assets and liabilities reported on the statements of cash flows will not necessarily agree with changes in the corresponding balances on the balance sheets. Income Statement - Extraordinary and Unusual Items (Subtopic 225-20): Simplifying Income Statement Presentation by Eliminating the Concept of Extraordinary Items. In January 2015, ASU 2015-01 was issued, which eliminates the concept of extraordinary items. This update became effective at the beginning of our 2016 fiscal year. The adoption of this ASU did not have a significant impact on our consolidated financial statements and disclosures. Presentation of Financial Statements - Going Concern (Subtopic 25-40): - Disclosure of Uncertainties about an Entity’s Ability to continue as a Going Concern. In August 2014, the FASB issued ASU 2014-15, requiring management to evaluate whether there is substantial doubt about the Company’s ability to continue as a going concern. This update is effective for the annual period ending after December 15, 2016, and for annual and interim periods thereafter. We have adopted this ASU and the adoption did not have a significant impact on our financial statement and disclosures. The Company’s policy is to evaluate events and transactions through the date the financial statements are available for release for potential disclosure as subsequent events. The accompanying financial statements have been prepared assuming that the Company will continue as a going concern. The Company has suffered recurring losses from operations, has a substantial working capital deficiency and substantial accumulated deficits and comprehensive loss that raise substantial doubt about its ability to continue as a going concern. Management's plans to address these issues are to achieve and maintain profitability which depends on the growth of our market share, the acceptance of our services by our customers, the competitiveness of our death care management consultant services, and our ability to control our costs and expenses. Additionally, our controlling shareholders will continue to contribute capital if required as they did in 2017. Our plans also include raising substantial capital from share purchase agreement from outside entities. As of December 31, 2017 and 2016, there was no allowance for slow moving or obsolete inventory. Depreciation expense for the years ended December 31, 2017 and 2016 was $83,447 and $87,971, respectively. Where quoted prices are available in an active market, investments held by the trust are classified as Level 1 investments pursuant to the three-level valuation hierarchy. The Company’s Level 1 investments include cash and money market accounts and mutual funds. There are no Level 2 and Level 3 investments in the Company’s trust portfolio as of December 31, 2017 and 2016. Amortization expense related to the patents for the years ended December 31, 2017 and 2016 amounted to $1,088 and $1,088, respectively. In January 2016, the Company advanced its Chief Executive Officer approximately $62,000 (NT$2,000,000) as earnest money to continue negotiations of the pending merger between the Company, Long Bao Life and Ho Cheng Insurance. Initially, the parties could not reach agreement on merger terms and the deposit was returned to the Company in April 2016. On December 29, 2016, the merger was as previously disclosed. As of December 31, 2015, Long Bao Life had advanced $52,817 to a former member of Long Bao Life’s Board of Directors. The director left Long Bao Life’s Board in December 2014. The advances were collected in 2016. During the years ended December 31, 2017 and 2016, the Company purchased inventories of $0 and $46,263, respectively, from a company controlled by a family member of the Company’s Chief Executive Officer. As of December 31, 2017 and 2016, there were no liabilities to the affiliated company for inventory purchases. During the years ended December 31, 2017 and 2016, the Company’s Chief Executive Officer, affiliated and family members purchased certain products from the Company for $28,431 and $29,068, respectively. As of December 31, 2016, the Company had a liability of $12,378 to its Chief Executive Officer for short-term borrowings. The liability is non-interest bearing and are payable on demand. During the years ended December 31, 2017 and 2016, the Company leased offices from the Company’s Chief Executive Officer and two directors. Total lease expense to the related parties during 2017 and 2016 were $67,989 and $104,078, respectively. As of December 31, 2017 and 2016, the Company had a lease deposit of approximately $5,600 and $6,500, respectively, held by the related parties. During the years ended December 31, 2017 and 2016, the Company incurred $16,306 and $40,771 of commission costs to a company controlled by a family member of the Company’s Chief Executive Officer. As of December 31, 2017 and 2016, amount payable to the affiliated company for commissions were $886 and $12,190, respectively. Longbau Group, Inc. and Longbau Group Limited had no operating profit to be taxed for the years ended December 31, 2017 and 2016. Capital gains or losses derived from the sale of securities are exempt from regular income tax assessment in Taiwan. Non-deductible expenses mainly included losses from the sale of securities of $47,501 and $47,501 for the years ended December 31, 2017 and 2016, respectively. Long Bao Life and Ho-Cheng Insurance’s tax returns are subject to annual compliance review by the taxing authorities in Taiwan. The taxing authorities have examined Long Bao Life’s income tax returns through 2015 and Ho-Cheng Insurance’s income tax returns through 2014. A valuation allowance has been established because more-likely-than-not uncertainties exist with respect to our future realization of certain trust investment value. The valuation allowance reflects our expectation that the losses from valuation allowance in certain trust investments will not recovered. In accordance with the Income Tax Act in Taiwan, gains (losses) derived from the sales of securities are not taxable (deductible). Therefore, gains (losses) from sales of securities is a permanent difference between taxable and book income when realized. As of December 31, 2017, the Company had income tax receivable of $29,373 and at December 31, 2016, the Company had income tax payable of $15,971. Pursuant to the preneed contracts with the customers, the Company agreed to pay interest starting from the date that the full contract price is collected by the Company. The interest is calculated based on 80% of the contract price at a rate of 5% per annum for contracts entered in or prior to February 2009 and based on 100% of the contract price at a rate of 2.37% per annum for contracts entered after February 2009 but before February 2011. Starting from March 2011, interest is calculated based on 100% of the contract price at the one-year certified deposit rate of postal service announced by the Chunghwa Post Co., Ltd. in Taiwan (Currently 1.04% per annum). The interest is paid annually and included in cost of revenues in the statement of operations. Interest expense related to the preneed contracts were $87,454 and $88,650 for the years ended December 31, 2017 and 2016, respectively. On December 30, 2014, the Company entered into a land purchase agreement with a third-party individual. Pursuant to the agreement, the Company agreed to purchase 1,296 square feet of land in Tauyuan, Taiwan for $1,972,063 (Taiwanese $62,600,000). The title of the land has been transferred to the Company with the ownership certificate held in escrow until the total purchase price is paid. The remaining balance of $963,043 (Taiwanese $31,100,000) payable shall be made when the Company has secured financing. The Company is currently seeking a loan from a commercial bank. The land is currently a collateral to a bank for the seller’s outstanding borrowing. We have presented amounts incurred for this acquisition as a deposit for purchase of land in these financial statements and reclassified the asset from property and equipment in our presentation of property and equipment as of December 31, 2016. During the year ended December 31, 2017, Ho-Cheng received a capital contribution of $92,841 ($3,000,000 Taiwanese $) from one of its shareholders. 3) The remaining balances shall be allocated according to the resolution of the shareholders’ meeting. Legal capital reserve may be used to offset a deficit or be distributed as dividends in cash or stocks for the portion in excess of 25% of the paid-in capital if the Company incurs no loss. The appropriations of 2016 and 2015 statutory earnings of $78,258 and $65,349 have been approved by the Long Bao Life and Ho-Cheng Insurance’s shareholders in its meetings held during 2017 and 2016, respectively. The Company maintains substantially all its cash with banks in Taiwan. Should any bank holding cash become insolvent, the Company would lose the cash with that bank; however, the Company has not experienced any losses in such accounts and believes it is not exposed to any significant risks on its cash in bank accounts. In Taiwan, a depositor has up to approximately $93,000 (Taiwanese $3,000,000) insured in a bank. As of December 31, 2017 and 2016, $400,287 and $306,184, respectively, of the Company’s cash and cash equivalents was not insured. The Company purchased 100% of materials from one vendors for the year ended December 31, 2017 and 78% of materials from three vendors for the year ended December 31, 2016. As of December 31, 2017 and 2016, the amounts due to these vendors included were $43,022 and $33,265, respectively. The Company believes there are numerous other suppliers that could be substituted should the supplier become unavailable or non-competitive. The Company received commissions from four major insurance carriers in both 2017 and 2016 for the insurance segment. Each of the insurance carriers made up over 10% of the Company’s total revenues during 2017 and 2016. For the years ended December 31, 2017 and 2016, aggregated revenues generated from these carriers were $2,572,030 and $3,447,374, respectively. 4. lack of accounting personnel with adequate experience and training. During the three months ended December 31, 2017, there were no changes in our internal control over financial reporting identified in connection with the evaluation performed during the fourth quarter covered by this report that has materially affected, or is reasonably likely to materially affect, our internal control over financial reporting. Management assessed the effectiveness of the Company's internal control over financial reporting as of December 31, 2017. In making this assessment, management used the criteria set forth by the Committee of Sponsoring Organizations of the Treadway Commission in Internal Control-Integrated Framework (2013). Management's assessment included an evaluation of the design of our internal control over financial reporting and testing of the operational effectiveness of these controls. Based on this assessment, management has concluded that as of December 31, 2017, our internal control over financial reporting was not effective due to the material weaknesses in our control environment and financial reporting process mentioned above. This annual report does not include an attestation report of the Company's registered public accounting firm regarding internal control over financial reporting. Management's report was not subject to attestation by the Company's registered public accounting firm pursuant to the Company’s status as an emerging growth company under the Jumpstart Our Business Startups Act of 2012. The following table sets forth, as of December 31, 2017, the names and ages of our directors and executive officers. The directors will hold such office until the next annual meeting of shareholders and until his or her successor has been elected and qualified. The following summarizes the occupation and business experience for our directors and executive officers. Mr. Tsai Ko graduated from National Taichung Institute of Commerce and Technology in 1992 and received his Master's Degree from Institute of Finance and Insurance, Chaoyang University of Technology in 2009. Mr. Ko founded Dongsheng Insurance Brokers Co. Ltd. in 1994 and Ho-Cheng Insurance Brokers Co. Ltd. in 2000 respectively. In 2012, the integrated company run by Mr. Ko, with over one thousand salesmen, became one of the largest insurance brokers companies in Taiwan. Additionally, Mr. Ko is the CEO of Ho-Yun Biotechnology Co. Ltd. and Wei Mao Marketing Co., Ltd. which are invested and operated by him. Mr. Ko is also the President of Insurance Brokerage Association of Taiwan. Mr. Ko was selected as a director because of his experience playing key management roles in many companies. Ms. Yueh-Kuei Ko graduated from Overseas Chinese University. Ms. Ko has served as the CEO of Dongsheng Insurance Brokers Co. Ltd. and Ho-Cheng Insurance Brokers Co. Ltd. since 2002 and 2013, respectively. Ms. Ko has been engaged in insurance and financial work for ten years, and she is familiar with the related funeral management field. Ms. Chih-Wei Huang graduated from Open Business College Affiliated with National Taichung University of Science and Technology in 1989 and majored in International Trade. Ms. Huang passed personal insurance broker of special examination in 1994. Ms. Huang founded Zhongyun Insurance Brokers Co. Ltd.in 1995. Ms. Huang has been the authorized signatory of life insurance of Ho-Cheng Insurance Brokers Co. Ltd. and Dongsheng Insurance Brokers Co. Ltd. since 2002 and 2003. Ms. Huang was selected as a director because of her experience working in the finance industry. Mr. Tsung-Min Chang, graduated from Open Business College Affiliated with National Taipei College of Business and majored in Business Management. Mr. Chang passed the examination of Chunghwa Post in 1985 and had worked at post office for 25 years. In his spare time, Mr. Chang founded Changhua County Volunteer Service Association to help the vulnerable groups. After his retirement in 2010, Mr. Chang took over the business of Wei Mao Biotechnology Co. Ltd. Mr. Chang was selected as a director because of his experience working in the service industry. Dr. Chung Der Wu joined Foxconn Technology group in 2012 and has been working as Assistant Vice President for five years, is responsible for incubating internal new businesses with his experience in technology and management. Previously he worked at the Institute of Information Industry, a Taiwan software national lab, for various innovative technologies. He was also a founding member in a Taiwan telecom. Prior to 2001, he worked at Lucent Technologies in the United States as a telecommunications equipment product manager and was responsible for the South America and Taiwan market. Throughout his 30+ years of experience, Dr. Wu has worked in various different fields and the Company believes his experience can make a great contribution to the Company. Dr. Wu holds a Ph.D in Nuclear Engineering from the University of Cincinnati and an Masters of Business Administration from the University of Phoenix. Dr Wu was selected as a director because of his management experience at Foxconn Technology Group. Mr. Hsiang-Jen Cheng currently serves as Chairmen of Chuanpu Insurance Broker Co., Ltd., Chairmen of Global International Insurance Agency Co., Ltd., and President of the Insurance Brokerage Association of Taiwan. Mr. Chen previously served as Senior Vice General Manager at TransGlobe Life Insurance, Inc. Mr. Chen received a Bachelor of Arts degree from the Department of Business Administration at the Fu Jen Catholic University. Mr. Chen was selected as a director because his experience in the insurance industry can improve the Company’s management model. Mr. Chin-Shan Ko founded Chao Yuon Co., Ltd. (“Chao Yuon”) in 1992. Chao Yuon mainly produces wire shelving, metal furniture and related products and provides OEM/ODM services. Chao Yuon has 70 employees and has a turn-over of $7 million. Chao Yuon’s clients includes AGA Marvel, YAMAZEN, IRIS OHYAMA, ParagonCare Group, Space Logic, TECHNIBILT. Chao Yuon also cooperates with the famous designer Peter Opsvik from Norway (Globle Concept). Chin-Shan Ko was selected as a director because of his corporate management experience. Tsai Ko and Chih-Wei Huang are married. Tsai Ko and Yueh-Kuei Ko are siblings. No bankruptcy petition has been filed by or against any business of which any of our executive officers was a general partner or executive officer either at the time of the bankruptcy or within two years prior to that time. No director has been convicted in a criminal proceeding and is subject to a pending criminal proceeding (excluding traffic violations and other minor offenses). No director has been subject to any order, judgment, or decree, not subsequently reversed, suspended or vacated, of any court of competent jurisdiction, permanently or temporarily enjoining, barring, suspending or otherwise limiting his involvement in any type of business, securities or banking activities. No director has been found by a court of competent jurisdiction (in a civil action), the Commission or the Commodity Futures Trading Commission to have violated a federal or state securities or commodities law, that has not been reversed, suspended, or vacated. The Board of Directors has not yet appointed an Audit Committee, a Compensation Committee or a Nominating Committee. The functions that would be performed by such committees are performed by the Board of Directors. Our board of directors functions as an audit committee and performs some of the same functions as an audit committee including: (1) selection and oversight of our independent accountant; (2) establishing procedures for the receipt, retention and treatment of complaints regarding accounting, internal controls and auditing matters; and (3) engaging outside advisors. We are not a "listed company" under SEC rules and are therefore not required to have an audit committee comprised of independent directors. Our board of directors has determined that its members do not include a person who is an "audit committee financial expert" within the meaning of the rules and regulations of the SEC. Our board of directors has determined that each of its members is able to read and understand fundamental financial statements and has substantial business experience that results in that member's financial sophistication. Accordingly, the board of directors believes that each of its members have the sufficient knowledge and experience necessary to fulfill the duties and obligations that an audit committee would have. Under Delaware law and pursuant to our articles of incorporation and bylaws, we may indemnify our officers and directors for various expenses and damages resulting from their acting in these capacities. Insofar as indemnification for liabilities arising under the Securities Act of 1933 may be permitted to our officers or directors pursuant to those provisions, our counsel has informed us that, in the opinion of the SEC, this indemnification is against public policy as expressed in the Securities Act, and is therefore unenforceable. The Board of Directors will consider candidates recommended by shareholders. Any shareholder who wishes to recommend a candidate for the Board should address the recommendation in writing to the Chairman of the Board at the Company’s principal executive offices. The Company has not yet adopted a Code of Ethics that applies to its executive officers, due to the small size of its management. The following table sets forth all compensation awarded to, earned by or paid to our named executive officer directly or indirectly from the Company or its subsidiaries. We currently do not have any employment agreements with our executive officers. Our directors do not currently receive compensation. The following table sets forth, as of May 3, 2018, certain information regarding the beneficial ownership of Common Stock by (i) each person who is known by us to own beneficially more than five percent of the outstanding Common Stock, (ii) each of our director and named executive officers, and (iii) all directors and named executive officers as a group. Unless otherwise specified, the address of each of the persons set forth below is in care of 11F.-3, No.100, Sec. 1, Zhongqing Rd.,, North Dist., Taichung City 404, Taiwan (R.O.C.). (1) Based on 30,500,000 shares outstanding as of June 30, 2018. (2) Includes (i) 9,087,500 shares held by Tsai Ko (“Mr. Ko”), (ii) 3,112,250 shares held by Chih-Wei Huang, Mr. Ko’s wife, (iii) 1,567,000 shares held by Fu-Mei Huang Tu, Mr. Ko’s mother in law, (iv) 1,531,917 shares held by Ming-Ching Ko, Mr. Ko’s brother, (v) 1,500,000 shares held by Ho Yun Manage Ltd, controlled by Cheng-Hstung Chou, Mr. Ko’s brother in law, (vi) 1,500,000 shares held by Ho Cheng Management Co Limited, controlled by Yen-Yu Ko, Mr. Ko’s sister in law’s son, (vii) 1,200,000 shares held by Pei-Yu Ko, Mr. Ko’s sister, and (viii) 1,500,000 shares held by Yueh-Kuei Ko, Mr. Ko's sister. Tsai Ko and Chih-Wei Huang disclaim beneficial ownership described in items (iii) – (viii) above. The Company does not currently have an insider transaction policy. We have not had a promoter at any time since inception. Therefore, we have never entered into transactions with a promoter. (D) Any relative or spouse of any of the foregoing persons, or any relative of such spouse, who has the same house as such person or who is a director or officer of any parent or subsidiary of us. On December 29, 2016, Longbau Group, Inc. (“Longbau”), Long Bao Life Technology Co., Ltd (“Long Bao Life”), the Shareholders of Long Bao Life, and Tsai Ko entered into a Share Exchange Agreement (the “Long Bao Life Agreement”). Long Bao Life is a private company incorporated in Taiwan in 2007. At the December 29, 2016 closing of the Long Bao Life Agreement, 250,000 shares of Longbau common stock, par value $0.00001 per share were issued to Long Bao Life shareholders in exchange for 100% of Long Bao Life's issued and outstanding ownership interests (“Long Bao Life Exchange Shares”). Upon completion of the foregoing transaction, Long Bao Life became a wholly-owned subsidiary of Longbau. On December 29, 2016, Longbau, Ho-Cheng Insurance Brokers Co., Ltd. (“Ho-Cheng Insurance”), the shareholders of Ho-Cheng Insurance and Tsai Ko entered into a Share Exchange Agreement (the “Ho-Cheng Insurance Agreement”). Ho-Cheng Insurance is a private company incorporated in Taiwan in 2001. At the December 29, 2016 closing of the Ho-Cheng Insurance Agreement, 250,000 shares of Longbau common stock, par value $0.00001 per share were issued to Ho-Cheng Insurance shareholders in exchange for 100% of Ho-Cheng Insurance’s issued and outstanding ownership interests (“Ho-Cheng Insurance Exchange Shares”). Upon completion of the foregoing transaction, Ho-Cheng Insurance became a wholly-owned subsidiary of Longbau. Tsai Ko, Longbau’s Chief Executive Officer, Director and owner of 29.5% of Longbau’s outstanding common stock is (i) the Chief Executive Officer of Long Bao Life and owner of 12% of Long Bao Life’s ownership interests; and (ii) owner of 25% of Ho-Cheng Insurance’s ownership interests. Yueh-Kuei Ko, Longbau’s Chief Financial Officer, Director, and owner of 4.9% of Longbau’s outstanding common stock is (i) a Long Bao Life Director and 18% owner of Long Bao Life’s ownership’s interests and (ii) the Chief Executive Officer of Ho-Cheng Insurance and a 25% owner of Ho-Cheng Insurance’s ownership interests. In November 2015, in anticipation of planned merger transactions, the Company advanced approximately $30,400 (NT$1,000,000) to its Chief Executive Officer, who is also the Chief Executive officer of Long Bao Life and a majority shareholder of Long Bao Life and Ho-Cheng Insurance, for use as deposits on identified acquisitions. The funds were returned to the Company in December 2015 as the parties did not reach an agreement. In January 2016, the Company advanced its Chief Executive Officer approximately $62,000 (NT$2,000,000) as earnest money to continue negotiations of the merger. Because the parties couldn’t reach an agreement on the merger terms, the deposit was returned to the Company in April 2016. On December 29, 2016, the Company issued 500,000 common shares to acquire these two companies. As of December 31, 2015, Long Bao Life had advanced $51,796 to a former member of Long Bao Life’s Board of Directors. The director left Long Bao Life’s Board in December 2014. The advances were collected in 2016. The following members of our Board of Directors are independent, as “independent” is defined in the rules of the NYSE Amex: Chung Der Wu and Hsiang-Jen Cheng. Aggregate fees and expenses for professional services rendered for us by Thayer O’Neal Company, LLC and GBH CPAs, PC for the fiscal years ended December 31, 2017 and 2016 are set forth below. The aggregate fees and expenses included in the Audit category are fees and expenses billed for the fiscal years for the audit of our annual financial statements and review of our interim financial statements and statutory and regulatory filings. The aggregate fees and expenses included in each of the other categories are fees and expenses billed in the fiscal years. The Board of Directors has determined that the provision of these services is compatible with the maintenance of the independence of Thayer O’Neal Company, LLC. Other fees for fiscal year 2016 includes fees for the audits and reviews related to financial statements of Long Bao Life and Ho-Cheng Insurance prior to the Company’s acquisition of these companies on December 29, 2016. The Board of Directors has determined that the provision of these services is compatible with the maintenance of the independence of GBH CPAs, PC. It is the policy of the Company that all services other than audit, review or attest services must be pre-approved by the Board of Directors. (1) Incorporated by reference to our Registration Statement on Form S-1 filed with the SEC on March 14, 2014. (2) Incorporated by reference to our Current Report on Form 8-K filed with the SEC on August 14, 2015. (3) Incorporated by reference to our Current Report on Form 8-K filed with the SEC on December 30, 2016. (4) Incorporated by reference to our Annual Report on Form 10-K filed with the SEC on April 17, 2017. * The certifications attached as Exhibits 32.1 and 32.2 accompany this annual report on Form 10-K pursuant to 18 U.S.C. Section 1350, as adopted pursuant to Section 906 of the Sarbanes-Oxley Act of 2002, and shall not be deemed “filed” by the Registrant for purposes of Section 18 of the Securities Exchange Act of 1934, as amended. KNOW ALL PERSONS BY THESE PRESENTS, that each person whose signature appears below constitutes and appoints Tsai Ko his attorneys-in-fact, each with the power of substitution, for him in any and all capacities, to sign any amendments to this Annual Report on Form 10-K, and to file the same, with exhibits thereto and other documents in connection therewith, with the Securities and Exchange Commission, hereby ratifying and confirming all that each of said attorneys-in-fact, or his substitute or substitutes, may do or cause to be done by virtue hereof.